Jacob Anderson graduated from Georgetown University with a Bachelor of Science in Finance and Marketing and a minor in Psychology. He currently works in Wealth Management for Morgan Stanley in Manhattan. He grew up in both Seattle, Washington and Toronto, Ontario. He is a passionate sports fan, particularly for his Seattle-based teams, and stays active by exploring New York, running, and playing Ultimate Frisbee. He attends Redeemer Presbyterian Church and currently lives in Manhattan. There are many reasons why I wanted to run this race, some of which are very unique and specific to me, while others are very common, as I have found out by speaking with other runners. In spring 2015 I tore my ACL and both my menisci which led to surgery that summer. I wasn’t medically cleared to start jogging until January 2016, but that first time I was on a treadmill, even barely moving faster than a walk, I felt so liberated that I knew this was the year. I signed up shortly afterwards (probably way too early into my recovery), but I am so glad that I took that leap and just went for it. Other than my personal story, I chose this race in particular for many reasons that are shared amongst first-time marathoners. 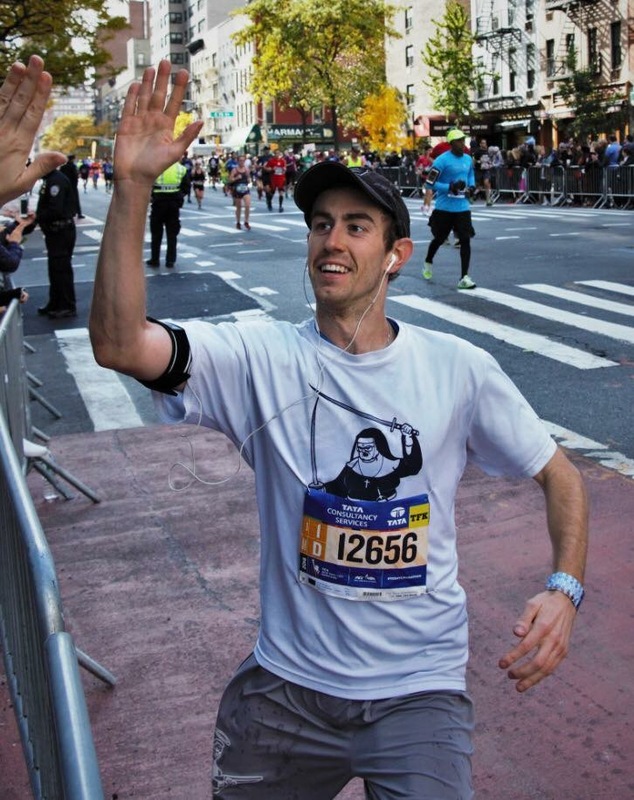 New York City is the biggest marathon in the world, with over 50,000 finishers. As a rookie, this is important as it means that every detail is meticulously planned and organized, that I don’t have to think about anything other than my training, and that there are more spectators cheering than one could count. 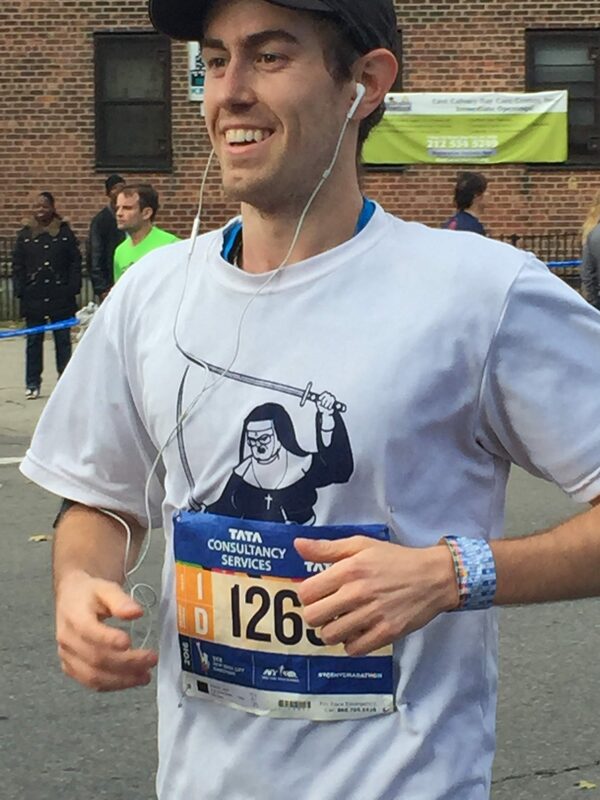 Also, as a resident of Manhattan, this is my home course, I cheer as people run by my apartment every year, and what a unique way to experience the passion and culture of the city than running through all five boroughs. As mentioned above, New York City is where I live, so when I was training, I had the actual course available to me. 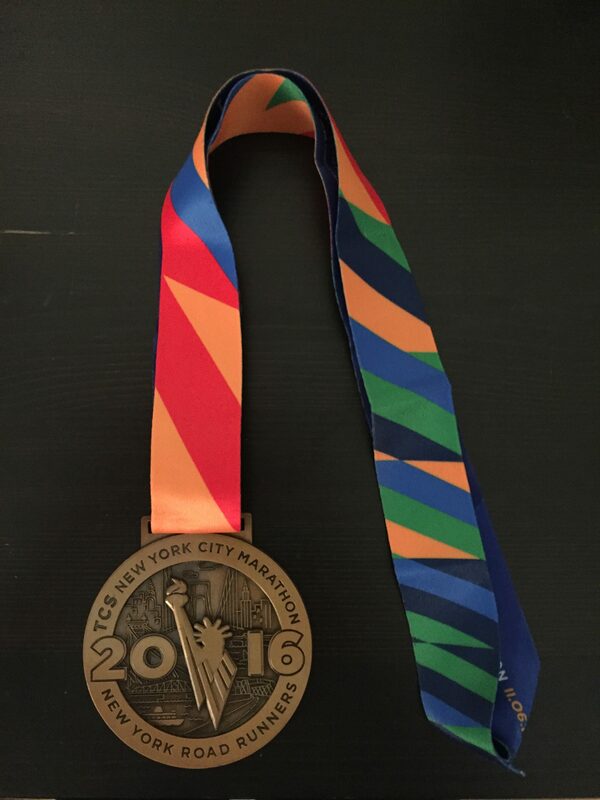 Throughout the months leading up to the race, I traversed the entire course (except for the Verrazano-Narrows Bridge) which meant that there was nothing new on race day. While not everyone lives in New York, I think this is a very applicable strategy that anybody running their local race can utilize. Stores and streets looked familiar; I knew when to conserve energy because there was a hill approaching; most importantly, when I was supposed to be hitting the wall, I had run the last 5-6 miles of the course literally 25+ times, so felt more confident and comfortable than most. This all said, much of my training was limited by my physical therapy and simply regaining running form, which meant that I am sure I had fewer training miles under my belt than many marathoners. The race expo is located at the Jacob K Javits Convention Center in Hudson Yards/Midtown West, a neighborhood in Manhattan. 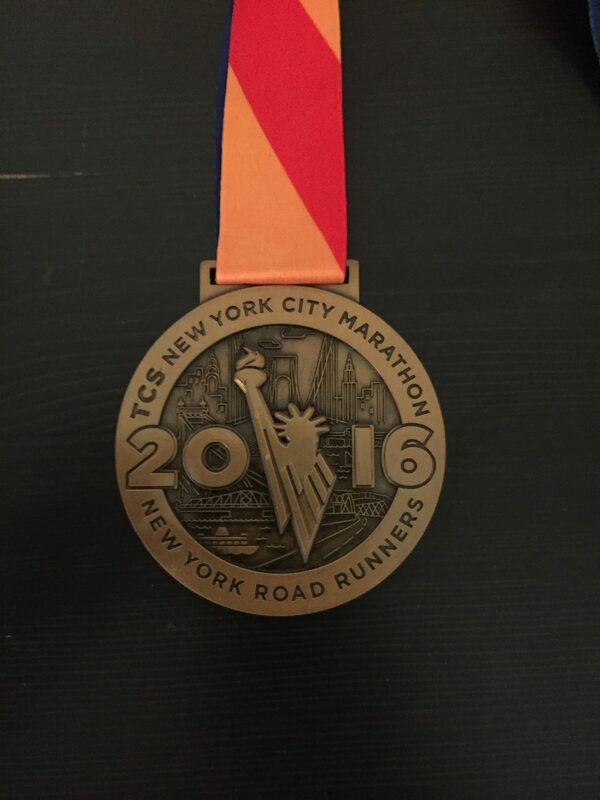 I was running with Team for Kids, one of the primary charity sponsors of the TCS New York City Marathon, so I did not experience the general participant check-in, but did note that there were dozens of check-in desks, and bib distribution was quick and easy. The booths were also what you would expect from a large marathon, people displaying their products or gadgets, and runners trying to see if there was any edge to be had over other runners. The race came with a nice, blue, long-sleeve tech shirt which fits comfortably and will be a frequent use in the future. Many people were wearing them on race day, which is not a surprise. I am a very simple runner, so only ran with a knee brace on my surgically repaired knee and did not carry anything with me. I used my iPhone in an armband for music to fill any sound lulls in the course and ran with Saucony Guide 9s. Temperatures started in the high 40’s which meant that I began the race with a winter hat on, which was quickly discarded after exiting the windy Verrazano-Narrows Bridge. After that I used a regular running hat to help with sun, glare, and sweat. Throughout the course I had friends who gave me Clif Bar Energy Chews. Fort Wadsworth on Staten Island is the meeting point for the race, which is quite difficult to get to. Because of this, there are buses provided from midtown Manhattan straight to Fort Wadsworth. I met my bus at 5:30 AM, arrived at the start village around 7:00 AM, and had just enough time to eat, stretch, warm-up, and relax before getting into my corral, hearing the National Anthem, and starting the race. 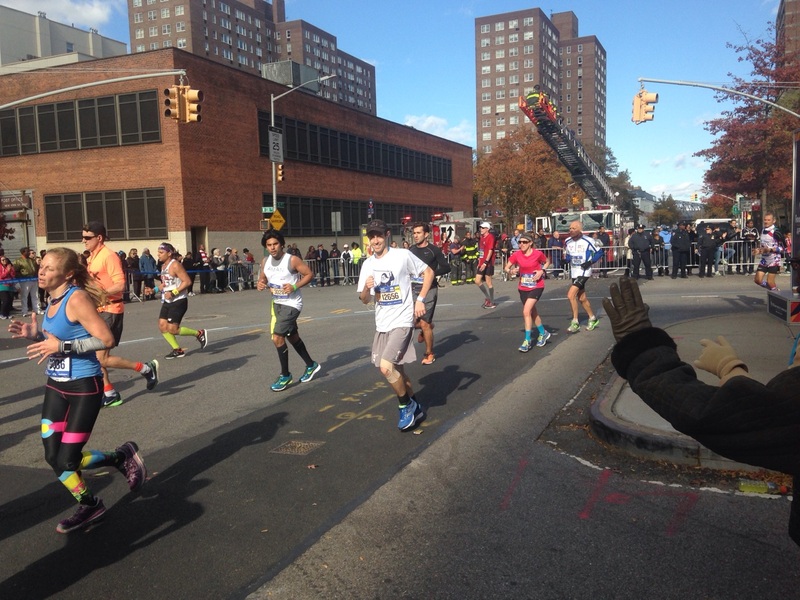 The course covers all five boroughs, beginning on Staten Island, passing through Brooklyn, Queens, Manhattan, into the Bronx, and then ending back in Manhattan. While it starts on Staten Island, it immediately leaves on the Verrazano-Narrows Bridge, a two-mile-long bridge into Brooklyn that provides great views of lower Manhattan. After the Verrazano-Narrows Bridge you enter Brooklyn, where you will spend the rest of the first half of the race, until mile 13. The majority of Brooklyn is spent on two streets: 4th Avenue and Bedford Avenue. Both are lined with supporters, bands, and lots of enthusiasm, especially around the Barclays Center at the end of 4th Avenue, where there are multiple bands and lots of support. But for me the highlight in Brooklyn is Lafayette Street. Lafayette is where multiple corrals merge and the road narrows, leading to frustrating congestion, but there were people cheering three and four deep, and the shape of the street led to a natural tunnel of noise, making for a very fun atmosphere for the mile that you are on it. Eventually you cross the Pulaski Bridge into Queens, which is another fast borough, only existing for a couple miles before you enter Manhattan at mile 16. Queens provides a different feel from Brooklyn. 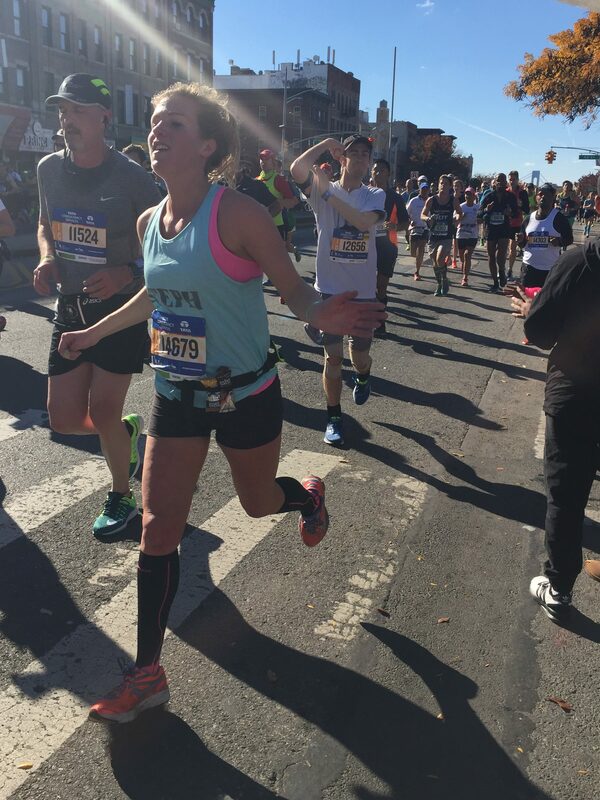 There were fewer people cheering, but that, combined with the 1.5-mile 59th Street Bridge, provides the perfect scenario to regroup, refocus, and get yourself hyped for the difficulties that lie ahead. Once you enter Manhattan, you are met with a wall of support on 1st Avenue. I had heard that this is one of the most fun parts of the course, but did not believe that it could motivate you as much as I had read, and boy was I wrong. I realized as my body started feeling better that I had been in a bit of a lull for the past mile or two, and this support was exactly what I needed. 1st Avenue is also a bit of a tease, as you are roughly a mile in actual distance from the finish line, but still have over ten miles left to run. Many parts of 1st Avenue run four and five people cheering deep, and the slight hills are barely noticeable with the roar of supporters. As you approach East Harlem the crowds do start to thin out, but there are some fun bands, and even a couple primary school bands providing music to get you through and to the Willis Avenue Bridge. Continuing with the theme of the course of alternating between being in a borough for a long time and a short time, you only run through the Bronx for a bit more than one mile. This mile, however, is mile 20-21, so at this point every mile can start to be a struggle as the finish line is not yet close enough to feel and your legs are starting to turn into jelly. There were fun performers lining the streets to make the time go quickly, and eventually you cross the Madison Avenue Bridge back into Manhattan. Congratulations! You’ve made it back to Manhattan! While you are still five miles from the finish line, you are finally running straight towards the end, have no more bridges to cross, and you start to believe that all is possible. Harlem is one of the most unique neighborhoods in New York, and that shows in the support you feel. There are bands, DJs, people cheering, and just a very fun vibe in these streets. This stretch was also my favorite training run because I started visualizing myself feeling tired but being able to grit my way through the last few miles, focusing on one step at a time, one block at a time. Eventually you run down the east side of Central Park, on 5th Avenue from 110th Street until 91st Street. This is perhaps the most difficult part of the course as it is a deceptive uphill. Once you enter Central Park at 91st Street, even though there are still a few miles to go, the end is near, and there is no better rush than this feeling. Running through this very popular stretch, you eventually exit the park onto 59th Street at the Plaza Hotel, have just over 0.5 miles until the finish and begin to really push it to the end. Eventually you turn back into the park at Columbus Circle, and one slight hill remains between you and the finish line. After you cross the finish line, there are many people there to take you by the hand and guide you through everything you need, from getting your heat sheet, getting your medal (definitely would be more fun if they put it around your neck like you won at the Olympics), and get you food and drink. There are medics in case you need assistance, and post-race opportunities for celebrating with your fellow runners. I ran into Meb and he was gracious enough to take a photo with me, which was a personal highlight. 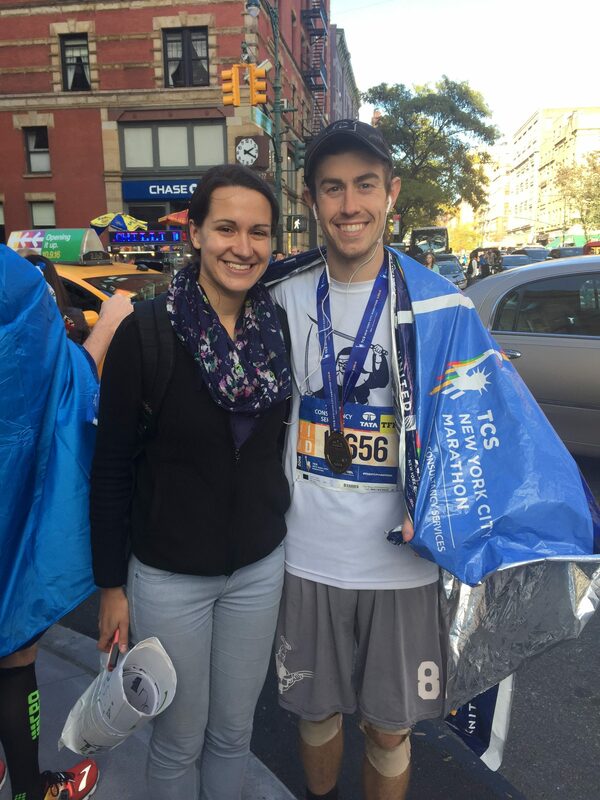 Overall, the race was an absolute blast, My was not bad for my first marathon, and I think New York is the perfect race for anyone’s maiden voyage.